TAKE A LOOK AT THESE HELPFUL RESOURCES TO BETTER UNDERSTAND OUR PRODUCTS. 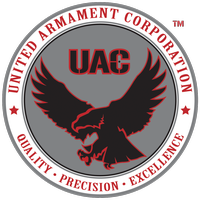 Thank you for your interest in United Armament Corporation products. Our WHISPERTEC™ Suppressor line is required to be transferred in accordance with NFA rules. To find a dealer near you, please fill out the form below and include your zip code. We are currently seeking high quality dealers to provide this service, as well as stock and sell our products in your area. If you have a dealer you would like to recommend, please use the form below and let us know! Yes. Suppressors are recognized under federal law as a Class 3 firearm and regulated under the National Firearms Act. Citizens can apply for ownership and possession under the law through the BATFE (Bureau of Alcohol, Tobacco, Firearms and Explosives) for a one-time tax stamp for legal possession. In most of our 50 states, yes. Some states have passed laws prohibiting suppressor ownership. 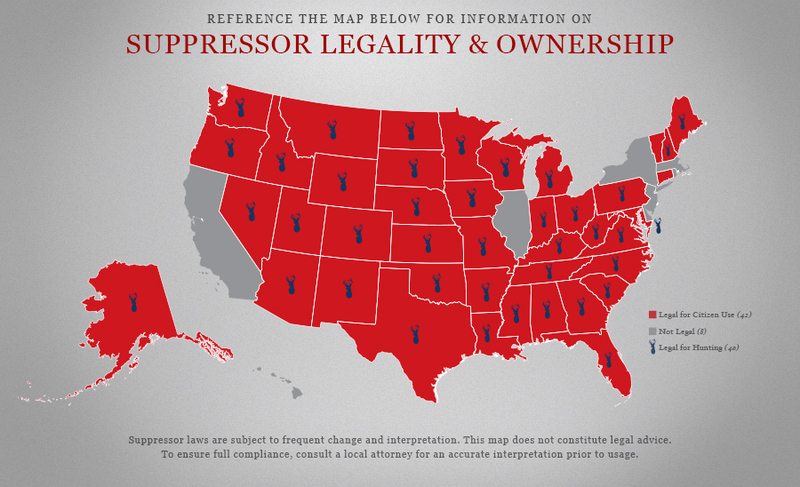 Under “States Rights” authority, Suppressors cannot be sold in these states. Can I take my suppressor with me on a trip across state lines? Yes. As long as the states you are travelling to (and through) allow suppressor possession. Do I have to register my suppressor? No. There are no current laws requiring registration at the federal level. While buyers must submit paperwork for a background check, law prohibits the BATFE to maintain records past 5 years. How do I buy an NFA item? If you are 21 years of age or older, a citizen of the United States, and have no felony convictions, you may purchase a suppressor. You may buy on-line, at your local firearms retailer, or directly from the manufacturer if they are in your home state. If you have purchased your suppressor on-line, you would select and specify a local FFL (Federal Firearms Licensee) to provide in-state transfer for the suppressor, and the manufacturer will transfer the suppressor to them. On arrival, the local FFL will prepare a BATFE form 5320.4 packet for you. This will require a 2×2 color photograph of you, as well as a set of fingerprint cards for submittal to the BATFE for the required background check. You then send the form package to the BATFE along with the $200 federal tax. On approval (this varies based on BATFE backlog from 6-10 months), the FFL will receive authorization to transfer, along with the original tax stamp for the suppressor. Your local FFL may then issue the tax stamp to you with your suppressor. A copy of the tax stamp must be available with the suppressor at all times to be in legal possession. If you purchase a suppressor from your local FFL/dealer, the process is the same for submittal and approval. This is also true if you purchase directly from the manufacturer in your home state. Is a suppressor considered a firearm, or is it an accessory? Logically, you would think it is an accessory, but the BATFE has defined a suppressor a schedule 2 firearm as listed in the National Firearms Act. What is an “NFA Firearm”? Are suppressors legal for hunting? Most states now allow hunting with a suppressor. Some states do not allow suppressor possession at all, and a few more do not allow hunting suppressed. Can I buy spare parts if I lose or damage a part? You are allowed by law to purchase barrel adaptors without restriction. All other parts are considered “suppressor components” and are only available as a complete assembly. You can send your suppressor to the manufacturer for repair or replacement of components (Rebuild) without applying for transfer or additional tax. Are special tools required to install, remove or disassemble my suppressor? Does a suppressor change the recoil on a firearm? Does a suppressor change the point of aim on a firearm? Does a suppressor make the pattern size change on a firearm? How do I clean my suppressor? How often do I clean my suppressor? Why is sub-sonic ammunition important? Suppressors are capable of reducing muzzle report, as well as reducing or eliminating muzzle flash on virtually any ammunition, compared to firing without the suppressor in place. Ammunition which is designed to propel the projectile at speeds greater than the speed of sound (approximately 1080 Feet per Second) results in the projectile creating a small sonic boom as it moves through the air. This happens if the projectile is fired through a suppressor or not. This sonic trail is not only detectable by the human ear, it can be quite distinct on some projectile types. As a side note, projectiles fired and stabilized above the speed of sound will slow down over distance, and will de-stabilize as they cross the speed of sound downrange. This transition affect increases the spread from point of aim at distance, even on match grade ammunition. While sub-sonic ammunition has a more significant trajectory drop over distance, it does not de-stabilize in this way, and does not create the “Sonic Trail”. Why does a suppressor change the bolt cycling on an AR-15? Will a larger caliber suppressor work on a smaller caliber firearm? Yes. As long as the thread matches the barrel, or the correct adapter is used, a larger caliber suppressor will work on a smaller caliber firearm. HOWEVER – The sound performance will be compromised over using the specific caliber suppressor. Is the suppressor different for a 22 LR pistol and a 22 LR rifle?